The humble ladder can be a symbol of progress toward lofty goals. The lyrics of Bob Dylan’s “Forever Young,” for example, include a moving wish for the singer’s newborn son: “May you build a ladder to the stars and climb on every rung…” Symbolic ladders are also used by the Joint Monitoring Program of the World Health Organization (WHO) and the United Nations Children’s Fund (UNICEF) to communicate progress toward the goal of universal safe drinking water and sanitation. In “UN-speak,” that ambitious goal is Post-2015 Sustainable Development Goal #6, which includes specific targets and indicators that will help track progress toward a world in which waterborne illnesses are rare and sanitation is safely managed. 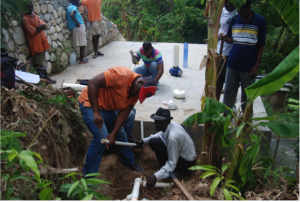 Clean water and safely managed sanitation are fundamental requirements for healthy and productive communities. Yet, a new report by the Joint Monitoring Program finds 2.1 billion people in 2015 (about 30% of the world population that year) lacked access to safe and readily available water at home, and more than twice that number, 4.5 billion, lacked safely managed sanitation. Although the Joint Monitoring Program has been tracking “WASH” (Water, Sanitation and Hygiene statistics) since 1990, the new report is the first “finger on the pulse” of global indicators for achieving Sustainable Development Goal #6. Importantly, the report notes that up to 90 countries may not meet the goal by the 2030 deadline set by the UN Sustainable Development Agenda. The “ladder” at left, from the Joint Monitoring Program report, shows the 2015 drinking water services ladder. Over 70% of the world population had safely managed drinking water that year; 17% had basic services, but 12% of the global population (the upper three rungs) had either limited or unimproved drinking water. Two percent of the world population used surface water (with no treatment). 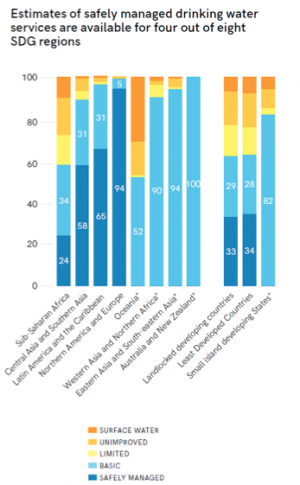 Similarly, the “ladder” at right demonstrates that only 39% of the world had safely managed sanitation services in 2015; 29% had basic services, and a full 32% of the population (uppermost three rungs) had limited or unimproved sanitation or practiced open defecation. Service ladders can be used to benchmark and compare progress across different stages of development, as shown in the figure at left. As the figure demonstrates, Oceana and Sub-Saharan Africa are much more lacking in safely managed drinking water services than North America and Europe. As business management guru Peter Drucker famously said, “If you can’t measure it, you can’t improve it.” We commend the Joint Monitoring Program, for only by tracking progress on safely managed drinking water and sanitation “up the rungs” of these service ladders will countries learn where to focus efforts and resources to mount to the top. Joan B. Rose, Ph.D., is the Homer Nowlin Chair in Water Research at Michigan State University, the editor of the Global Water Pathogen Project, and a member of the Water Quality & Health Council.